Below are the links and forms for instructors and tutors required to run the various training courses and assessments that make up the Canoeing Ireland Awards and Qualifications Scheme. 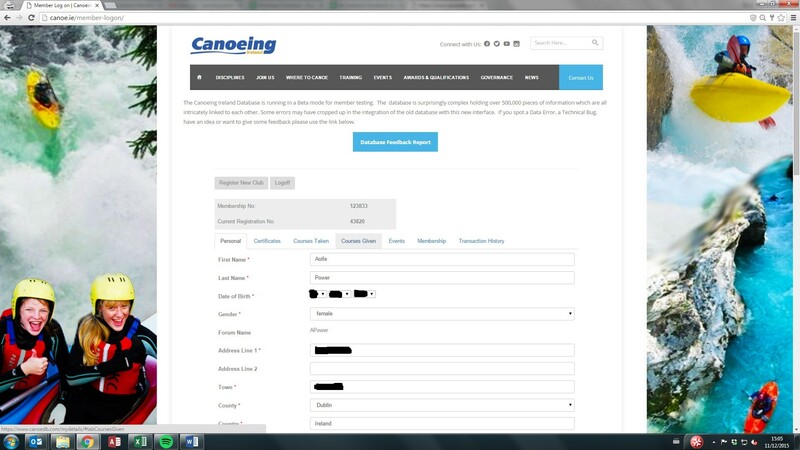 Apart from the forms at the bottom of the page, All forms for Instructors and Tutors of Canoeing Ireland can be done through your Database logon. 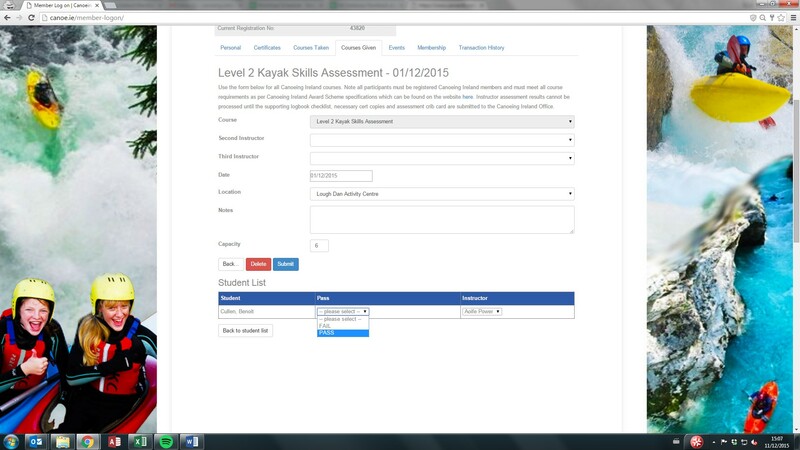 To apply for a Logbook Extension: Click here. On Google drive, please do the following and share with Canoeing dot Ireland at gmail dot com. Inside that folder create a folder with the student’s name. You can see all this ticked on their profiles on the DB, if these are not filled in, the system will not allow you add the student. Please email me if you have any questions. If you wish to save the Logbook check list and Crib card in the google drive, you can. This phase allows instructors to upload courses and assessments to the database aswell as submit and pay for certs online. We have been busy in the office with Brendan from Sulware, our developer, getting this phase ready to go live over the last few weeks. We are very happy with the work flow and functionality. Inevitably there will be some minor bugs that need to be ironed out so please keep us updated with your feedback here. Once you have submitted and paid for your certs it automatically shows up on the member’s profile. This is why all participants of level 3 skills and above courses must be members. We need a record of their courses in case they go down the instructor route themselves. The office will then process the certs and post them out. We will have all certs issued within three weeks of the cert being submitted and paid for. We recommend that all courses are uploaded at least 5 days before the start date to give course participants time to renew membership or meet any pre-requirements prior to the course. Note instructors will not be able to add expired members and anyone not meeting course pre-requirements, a full list of course pre-requirements can be found in the award scheme section of the website. After the courses have been uploaded you can then go back into the course to submit results and order certs. Please note that the cost for certs to be sent in bulk to the instructor remains at €4, we have had to increase the price of certs posted to individual participants from €5 to €6 due to increased postage costs over the last few years. Once an instructor is logged on to their online profile they should follow these steps. Click on images to enlarge. If you are logging level 1 and 2 kayak skills, sit on Top or RSR1 for non-canoeing Ireland members you use a google docs form. Found on this page. For all others you must fill in Course, Date and location. If doing certs for multiple instructors you can add them as second and third instructors. Click the Submit button. You can then add members onto your course using their email address. 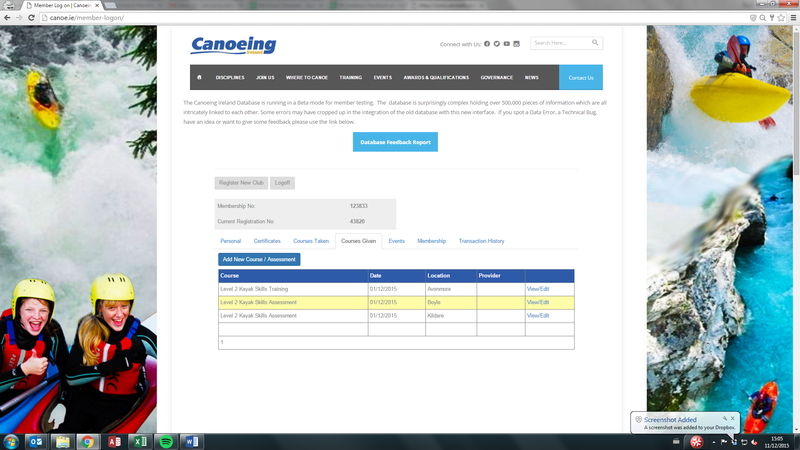 Please note the member must be a registered member of Canoeing Ireland. If you can’t find them and they are members of Canoeing Ireland please contact the office and we can fix it. Some emails recorded can be old email addresses. Then click Add. Add as many members to the course as you need. Once you have added everyone click the “submit results and order certs” tab. Through this window you can say the result of the assessment or choose which instructor issued the cert. Once you have selected your results tick whether you want the certs sent to me or certs sent to the member. Click Submit. You will then be brought to the payment window.